Based on infrasound signal observations made by 17 infrasound stations and published in the literature, the statistical analysis of the basic signal parameters (time delay, celerity, duration, oscillation period, and amplitude) has been performed as a function of the horizontal distance from the luminosity region of the Indonesian super-bolide to the place of a corresponding infrasound station. The approximating relations for the signal parameters as a function of range are presented. Correlation diagrams are constructed and analysed. The principal meteoroid parameters, the corrected infrasound wave celerity, and the mean troposphere-stratosphere wind speed are estimated. 1. Catastrophic Events Caused by Cosmic Objects, Ed. by V. V. Adushkin and I. V. Nemchinov (Akademkniga, Moscow, 2005; Springer-Verlag, Dordrecht, 2007) [in Russian]. 2.L. F. Chernogor, “Plasma, electromagnetic and acoustic effects of meteorite “Chelyabinsk”,” Inzh. Fiz. 8, 23–40 (2013) [in Russian]. 3.L. F. Chernogor, “The physical effects associated with Chelyabinsk meteorite’s passage,” Dop. Nats. Akad. Nauk Ukr., No. 10, 97–104 (2013) [in Russian]. 4.L. F. Chernogor, “Chelyabinsk meteoroid’s acoustic effects,” Radiofiz. Radioastron. 22 (1), 53–66 (2017) [in Russian]. 5.L. F. Chernogor and A. I. Lyashchuk, “Infrasound observations of the bolide explosion over Romania on January 7, 2015,” Kinematics Phys. Celestial Bodies 33, 276–290 (2017). 6.L. F. Chernogor and A. I. Lyashchuk, “Parameters of infrasonic waves generated by the Chelyabinsk meteoroid on February 15, 2013,” Kinematics Phys. 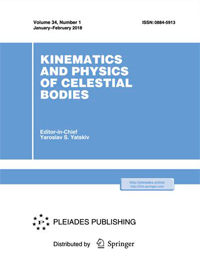 Celestial Bodies 33, 79–87 (2017). 7.P. Brown, R. E. Spalding, D. O. ReVelle, and E. Tagliaferri, “The flux of small near-Earth objects colliding with the Earth,” Nature 420, 294–296 (2002). 9.J. M. Harris and C. J. Young, “MatSeis: A seismic graphical user interface and toolbox for MATLAB,” Seismol. Res. Lett. 68, 307–308 (1997). 10.O. P. Popova, P. Jenniskens, V. Emel’yanenko, et al., “Chelyabinsk airburst, damage assessment, meteorite recovery, and characterization,” Science 342, 1069–1073 (2013). 11.D. O. ReVelle, “Historical detection of atmospheric impacts by large bolides using acoustic-gravity waves,” Ann. Acad. Sci. 822, 284–302 (1997). 13.E. A. Silber, A. L. Pichon, and P. G. Brown, “Infrasonic detection of a large bolide over South Sulawesi, Indonesia on October 8, 2009: Preliminary results,” in Meteoroids: The Smallest Solar System Bodies, (Proc. Meteoroids 2010 Conf., Breckenridge, Colorado, USA, May 24–28, 2010) (NASA Marshall Space Flight Center, Huntsville, AL, 2011), pp. 255–266. 14.C. J. Young, E. P. Chael, and B. J. Merchant, “Version 1.7 of MatSeis and the GNEM R &E regional seismic analysis tools,” in Proc. 24th Seismic Research Review, Ponte Vedra Beach, FL, Sept. 17–19, 2002 (Office of Scientific and Technical Information, U.S. Department of Energy, Oak Ridge, TN, 2002).